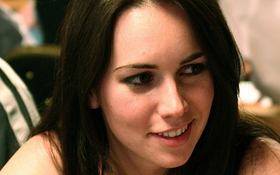 Amidst the Superbowl chatter yesterday, and all of the people financially rooting for certain scores, point spreads, and over/under lines, another story was developing on Twitter as Team PokerStars Pro Liv Boeree was making a deep-run in the PokerStars Sunday Warm-up tournament. Boeree, best known for win at the PokerStars EPT San Remo Main Event last year was able to best the field of 4,710 players to win the first place prize-money of $147,780.96; her largest online score to date. Boeree had to deal with a very tough final opponent in poker pro James Mackey, who has a WSOP win, along with online wins in the PokerStars SCOOP and WCOOP on his resume, but in the end it was Boeree who would come out victorious in the $215 buy-in tournament. Three of Boeree’s Team PokerStars teammates also made deep runs in the tournament, but two fell just short of the final table, Daniel Negreanu and Pieter de Korver, while Marcin Hoerecki joined Boeree at the final table. This entry was posted on Monday, February 7th, 2011 at 4:10 pm and is filed under Poker News. You can follow any responses to this entry through the RSS 2.0 feed. You can leave a response, or trackback from your own site.